Perfect your eyeliner skills with the beautyblender liner.designer Pro Tool, an innovative eyeliner application tool that allows you to create flawless, symmetrical eyeliner looks with ease and precision. Serving as a guide and 'steady hand', the flexible, silicone tool gently adheres to skin and allows you to line and define your eyes with speed and confidence; its three-sided design enables you to create a variety of angles and shapes. It is also great for lips and brows, and acts as a mess-free shield when applying mascara or eyeshadow. 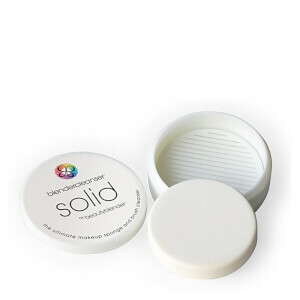 Housed in a mirrored compact with 5x magnifying mirror and suction cup to keep it steady on any smooth surface. Attach the compact to a hard surface using the suction cup and place at eye level. Use the mirror with a 5x magnifier for an eagle eye view to better apply your eyeliner.Rub the frosted liner.designer pro in between your hands to warm up the silicone for 10-15 seconds to help it gently adhere to skin. Store in compact for easy use. Easy to clean using blendercleanser®solid®.